Thoughts from a Buttonmonger: What the Hay? Up to the end of the 19th century, grass and legumes were not often grown together because crops were rotated. By the 20th century, however, good forage management techniques demonstrated that highly productive pastures were a mix of grasses and legumes, so compromises were made when it was time to mow. Later still, some farmers grew crops, like straight alfalfa (lucerne), for special-purpose hay such as that fed to dairy cattle. Loose hay was taken to an area designated for storage—usually a slightly raised area for drainage — and built into a hay stack. 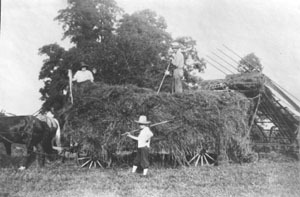 The stack was made waterproof as it was built (a task of considerable skill) and the hay would compress under its own weight and cure by the release of heat from the residual moisture in the hay and from the compression forces. 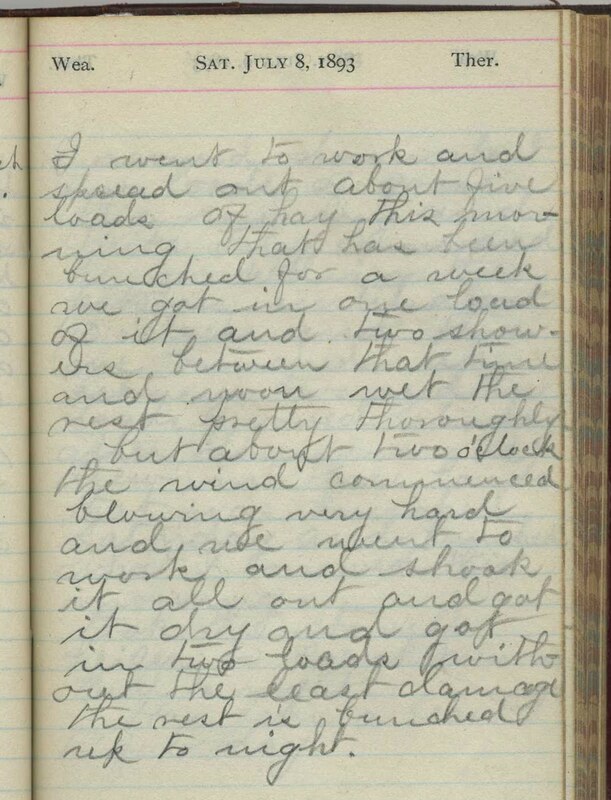 The stack was fenced from the rest of the paddock in a rick yard, and often thatched or sheeted to keep it dry. When needed slices of hay would be cut using a hay-knife and fed out to animals each day. On some farms the loose hay was stored in a shed or barn, normally in such a way that it would compress down and cure. Hay could be stored in a specially designed barn with little internal structure to allow more room for the hay. Alternatively an upper story of a cow-shed or stable was used, with hatches in the floor to allow hay to be thrown down into hay-racks below.